my animated LOST DOGS SNOW GLOBE!!! our roof and the deer are dropping their 'milk-duds'! Hey River Roofing!!!!!? NO...this isn't the ghost of Christmas Past! Have you seen my illustration of a WIFFLE-BALL 'ROACH ORNAMENT? 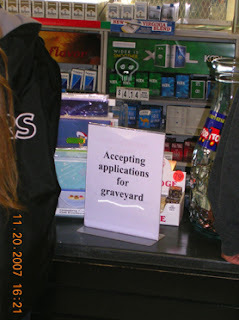 if you want to see a sharp one go HERE. and scroll down a bit, on the SFG site, to see my 'illy' and story! OFFICIAL FACIAL BINOCULAR RESEARCH CONDUCTED BY DR. TRAVIS HOWARTH/f.o.r.i. ACTUAL TOY SEEN AT A BARGAIN STORE THIS CHRISTMAS! IT"S THE NEW OXYMORON PHRASE (like 'military intelligence') - - - 'PEACEKEEPER'! 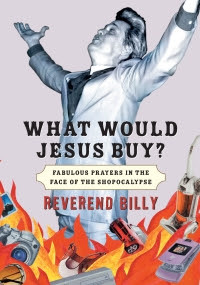 What Would Jesus Buy this Christmas? my McCoy Tyner illustration in JAZZTIMES! IT'S OUT! 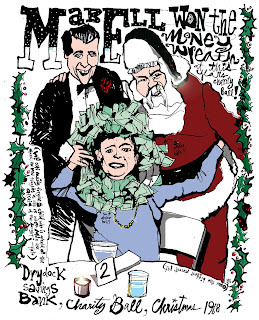 The December issue of JAZZTIMES has my McCoy Tyner illustration, on the music review page!! PLUS+ my bio and a picture of me near the front! Thanx so much Lee! 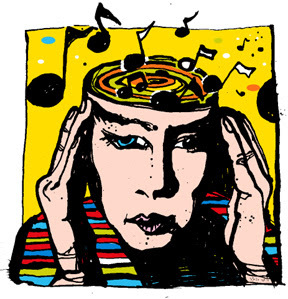 light the fuse of the PEACE bomb here.. . .. . .
Richard Rodgers & Richard Roberts: COINCIDENCE? Here's another illustration i did for THE DOOR and the 'Coincidence' series.... (a BIGGER version, that you'll be able to read - blogger doesn't view big images), will be posted on my official illustrationISM site. Thus Jews came to revere the ark as an earthly manifestation of God. The Old Testament describes its enormous powers—blazing with fire and light, halting rivers, blasting away armies and bringing down the fabled walls of Jericho. (Steven Spielberg's 1981 film Raiders of the Lost Ark provides a special-effects approximation.) According to the First Book of Kings, King Solomon built the First Temple in Jerusalem to house the ark. It was venerated there during Solomon's reign (c. 970-930 B.C.) and beyond. a recent illustration of mine.. . .. .
seen recently while paying for ga$ at a ¢onvenience store!!! view grandma licking her chops on my main illustrationISM site ('My Web Page' in the 'view my complete profile' link .. ... .. .) and dig the 'IRAQN-dometer'! 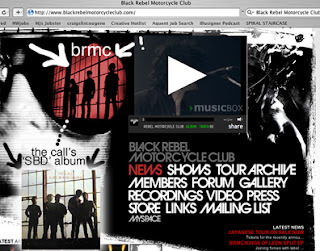 BRMC & Scene Beyond Dreams!!!?! Michael Been's son...and Michael Been (of the Call) is the sound manager now for BRMC as they tour europe! see bottom photo here http://the-call-band.com/photos.aspx (of dad & son) (i don't know if i'm boring you - i thought it was cool). i thought this pretty cool . . . maybe just you and me would . . . maybe not. the only other call fans i know of is my sister, t-bone, bono, peter gabriel and some jesus people community friends in chicago. Also the legacy and passing on of the ROCK & ROLLER 'BEEN TORCH' is burning bright. Is REact magazine still around? It seems like they disappeared. I'm glad i drew some illy's for them while they were around. (They were an youth insert paper on the east coast). 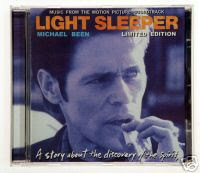 Does anyone know the where abouts of a LIGHT SLEEPER SOUNDTRACK CD...by Michael Been of The Call & BRMC? contact me if . . . .
trying to figure out how to post a test 'illy' on SFG is enough 'TO MAKE THE POPE CUSS!' but here's hoping . . . . . maybe i'll just hang out here in 'ISM' until i figure out how to frog this blog into Sugar Frosted Goodness [link below]! !